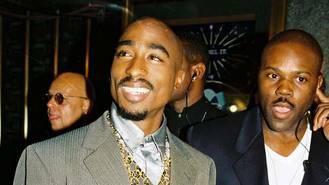 Tupac Shakur's Hummer that he owned before he died has sold at auction for $206,531 (£160,000). The truck, which was originally sold for $337,000 (£263,000) to an Ohio bidder in May 2016, was put back on the auctioning block after the anonymous buyer didn't pay for the winning lot. RR Auction relisted the Hummer and estimated that this time round it would only reach around $100,000 (£77,000) when the bidding closed on Thursday (17Aug17) at midnight. However it beat expectations when the final bid closed at $206,531(£160,000), making an additional $106,531(£83,000) more than anticipated. Tupac's Hummer was a relatively new purchase when the rapper died in a drive-by shooting in 1992 - he had only owned the truck for a month before his untimely death, and the vehicle had only clocked up 10,101 miles. The black Hummer had been customised to his rap star tastes and boasted diamond plated bumpers and an external PA system. It also featured beige leather interior throughout with a wooden trim and a top of the range sound system of the time, with speakers and a CD deck. The truck also boasted a personalised license plate which read "YAKNPAC", in honour of both its famous owner and fellow late rapper Yaki "Prince" Kadafi. The California Love singer's Woodland Hills pad, which he moved into in 1995 following a stint behind bars and called home until his death, is also up for sale and expected to sell for around $2.66 million (£2 million). Madonna shared a rare insight into her family life with a picture of her children. Cheryl shuts down reports of Justin Bieber collaboration: ‘It is not true’. Haim sisters Este have likened their meeting with Stevie Nicks to a scene in Disney classic Beauty and the Beast. Chance the Rapper is officially the youngest person to make Fortune's 40 Under 40 List this year (17). Liam Payne and Cheryl are reportedly planning to move to Los Angeles to help her career “take off”. Justin Bieber has told British popstar Cheryl he's just a phone call away if she ever wants help with her musical comeback. Shania Twain was convinced she'd never sing again when Lyme disease robbed her of her voice. Robin Thicke and his ex Paula Patton have reportedly resolved their custody issues by reaching a new agreement. Taylor Swift has left fans with a Blank Space after clearing her social media pages and making her official website go dark.